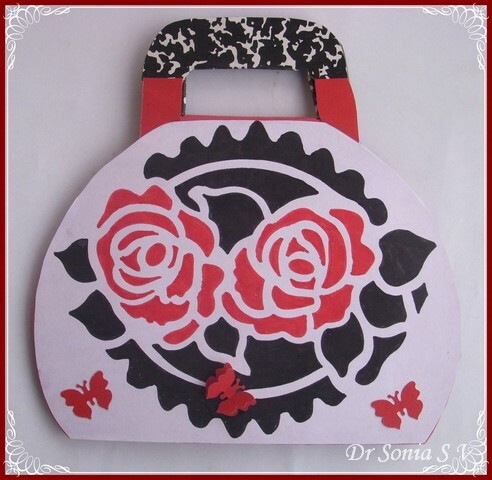 Shaped cards are so fascinating.The cards I make are usually gifted to special ladies in our lives and all ladies do love bags! 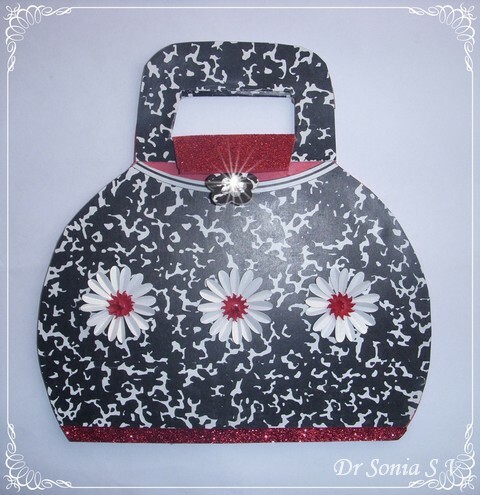 So made this purse shaped/bag shaped card using the cardboard cover of this book in yet another recycling craft. 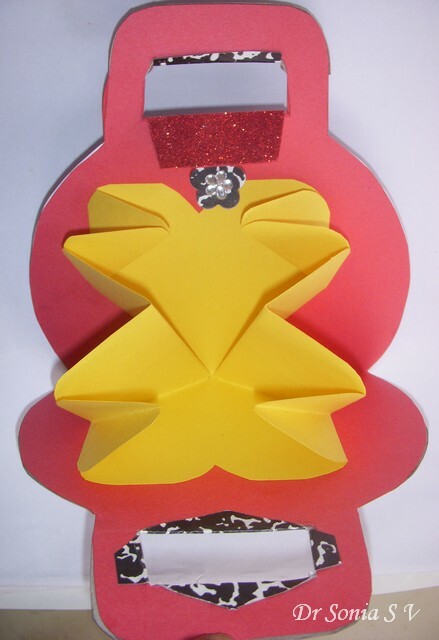 I made this bag shaped card by using a plate on a folded A 4 card! 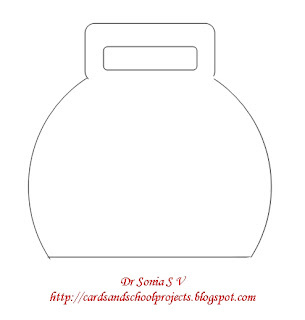 Just outline part of the plate circumference, add a handle shape and cut out! 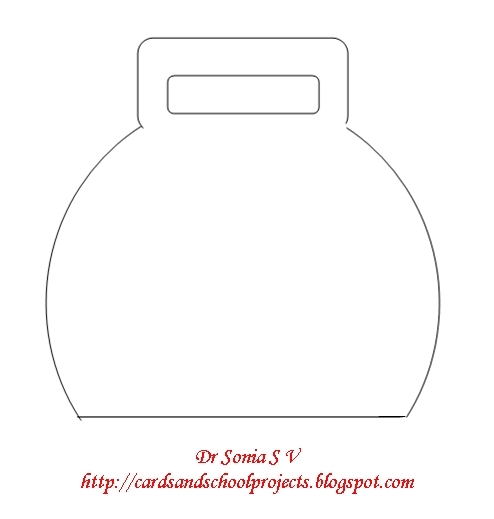 But for my blogger pals who love templates here is the bag shaped card template. 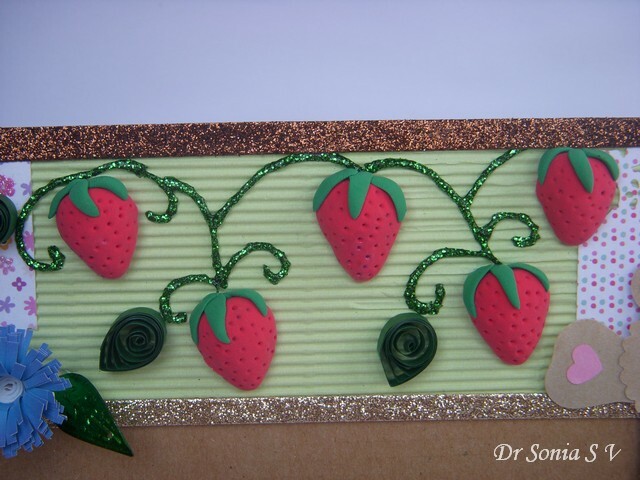 On the back of the card I used a stencil to make a floral design and added some punched butterflies. 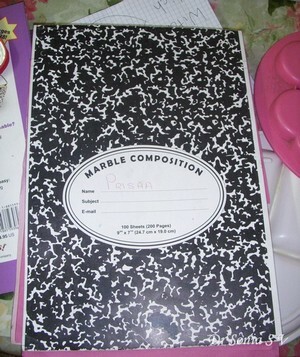 My little daughter was quite critical that I colored the leaves black[In her dictionary leaves should be green always]! 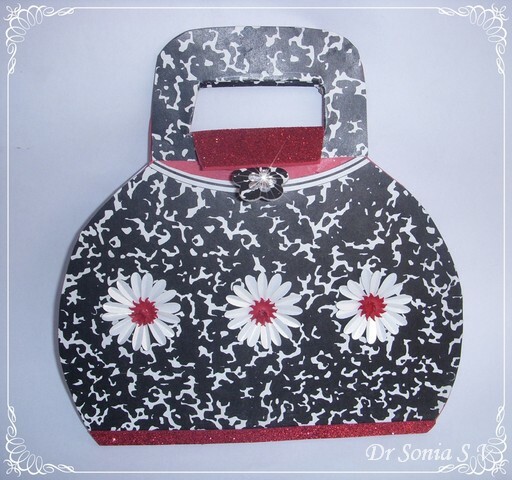 I played with photo-editing and added a sparkle to the rhinestone flower on the clasp of the bag! Hope you enjoyed this simple creation.Need to hear your opinions as this was somewhat "not my style" and received lots of criticism from my 5 year old assistant --especially for the black leaves ! 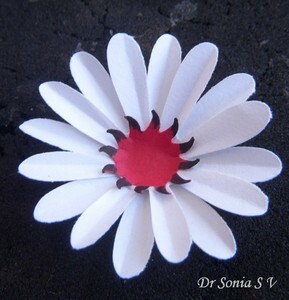 Sharing a simple paper flower tutorial. This tutorial is for the daisy in the Stationary Set posted earlier. 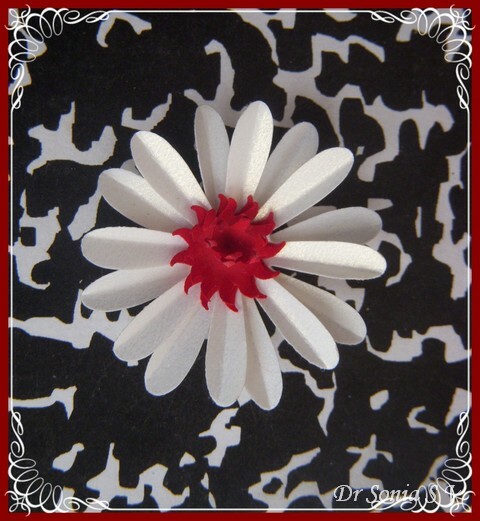 A few steps transform the flat punched daisy to a dimensional beautiful flower.This method can be adapted to many different punched flower shapes and not just the daisy. Punches-I punched 2 daisies , 2 suns and a tiny flower[optional] as shown for each Punchcraft Daisy flower. 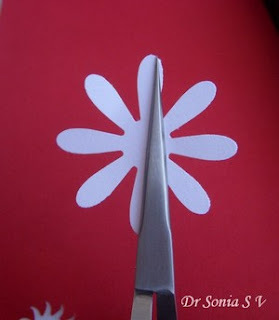 If you dont have a punch you can still use this tutorial techniques to shape and craft hand cut flowers. Fold over the flower at right angles at the forceps grip and in no time you can fold and crease all the petals to make a quick punchcraft flower. 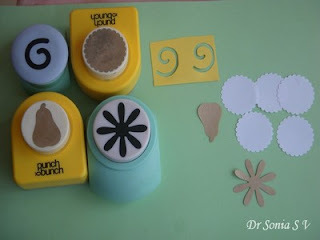 Use the shaped flowers as such or layer the 2 daisies to make your punchcraft flower. 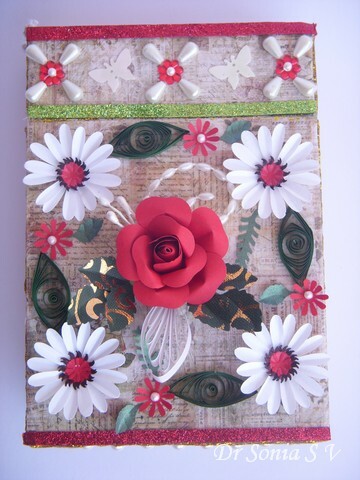 Layer the 2 flowers atop each other and glue with a dot of glue at the center. 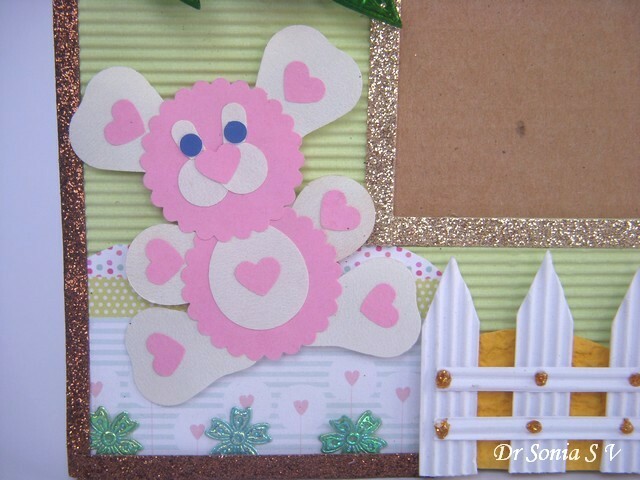 Make the center with contrasting color sun shape or any other shape you fancy. 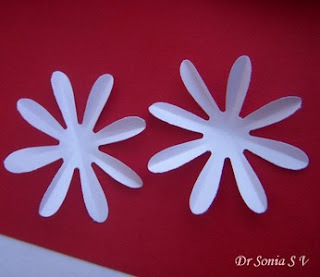 A neat trick is to shade the tips of the central shape of your paper flower. 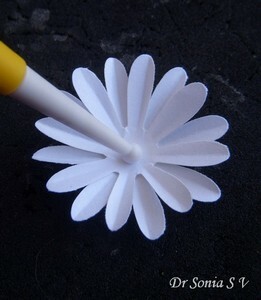 Apply a dot of glue on the center of the daisy and glue one central sun shape punchcraft flower. 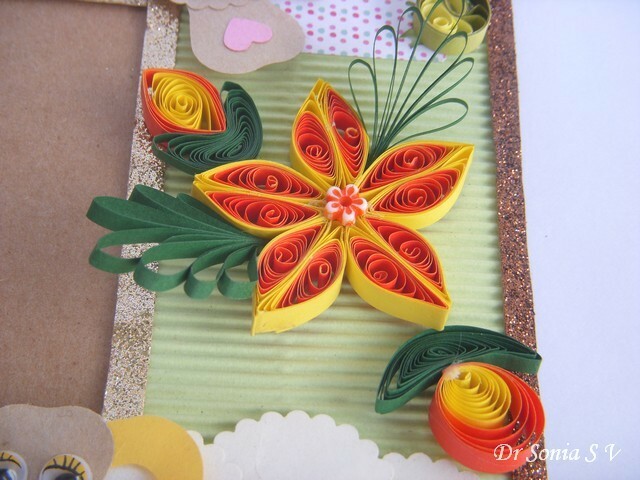 This is a simple punchcraft flower yet I had to share the tutorial as its so quick to make yet so beautiful to look at. I hope my dear blogger pals liked it too! 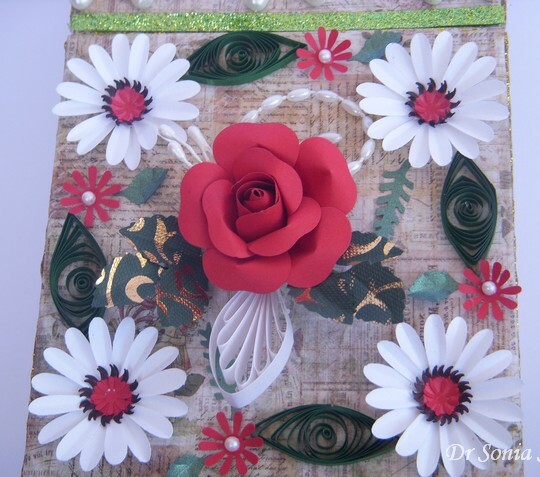 Here is the link to the Paper Rose Tutorial used in this stationery set. 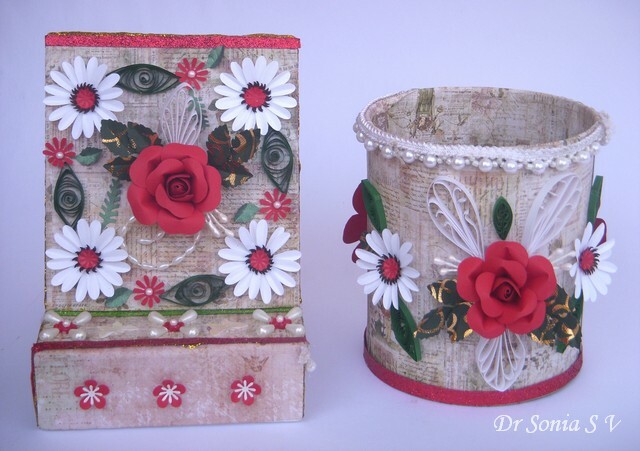 I love making Paper Flowers and these punchcraft flowers helped so much in transforming this tin can and cardboard box in yet another recycling craft. 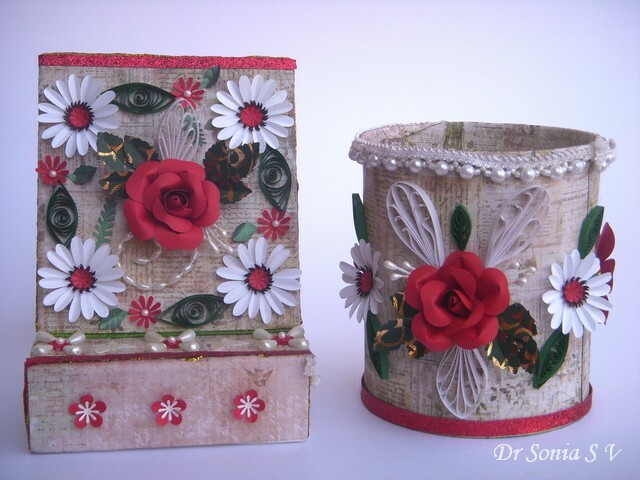 I made a stationery set of a pen stand and easel box type notepaper holder and decorated them with vintage paper , some quilling and lots of punchcraft paper flowers. I have never worked with vintage style paper -- this was part of a winnings from Lil Bee Boutique[Thank You Hana].So quite unsure how it has balanced out with the punchcraft flowers. 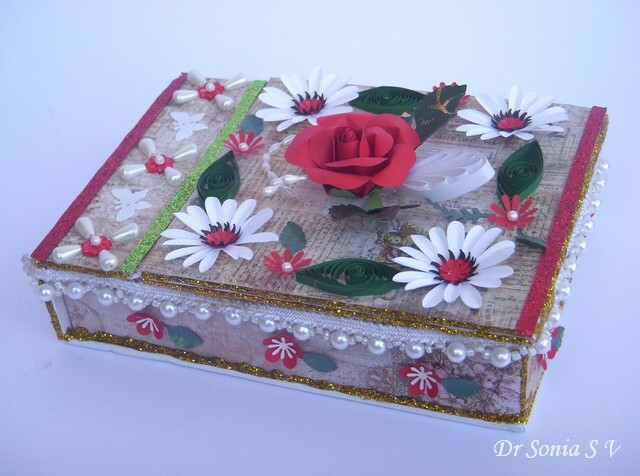 This is the lid of the box with quilled leaves and punchcraft flowers. 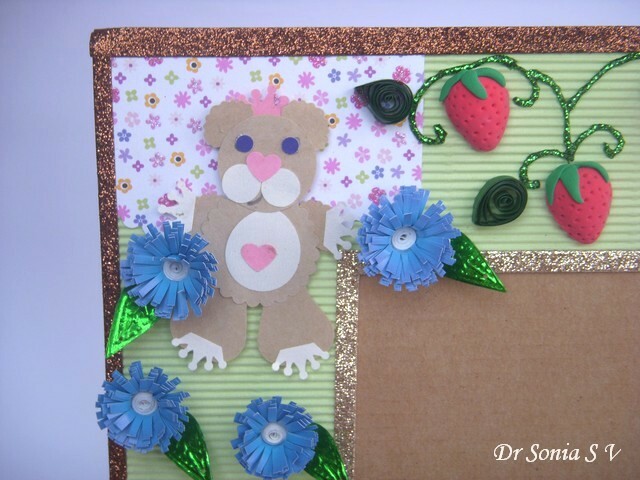 The lid of the box has an extra flap which can stand up like an easel to display the paper flowers. 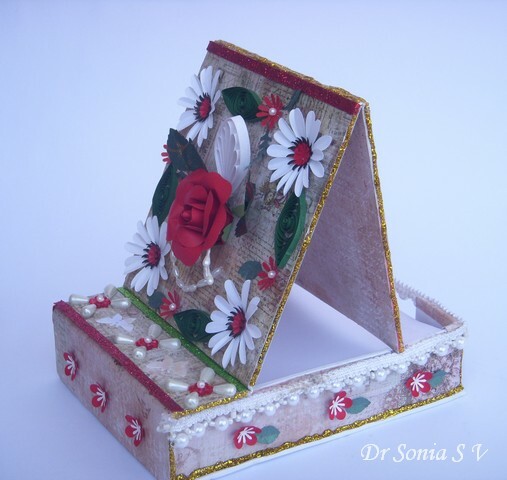 One can add a small photo or quote on the inner panel of the recycled box. 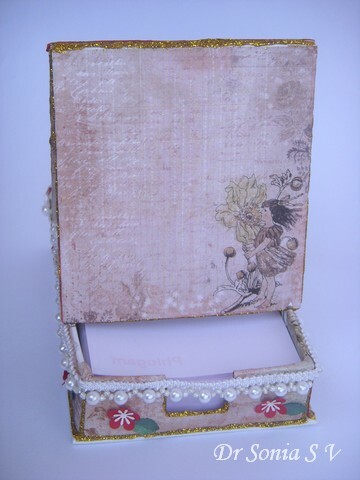 On the lower half of the box I added a lacy pearl border and some tiny punchcraft flowers. This matching stationery set was inspired by 2 blogger friends Hussena and Priya Sondhi who do such an awesome job of color coordination and " matching"! 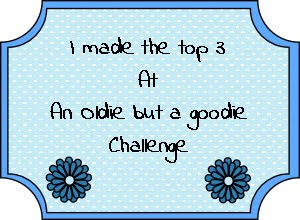 Do drop by their blogs to be fascinated! 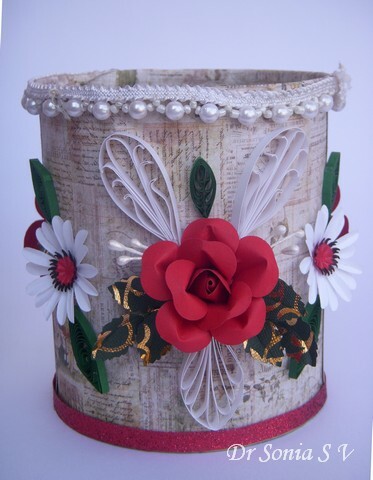 This is the closeup of the rose on the tin can which I recycled into a craft tool holder /penstand.To match with the box , I used the same type of punchcraft flowers. 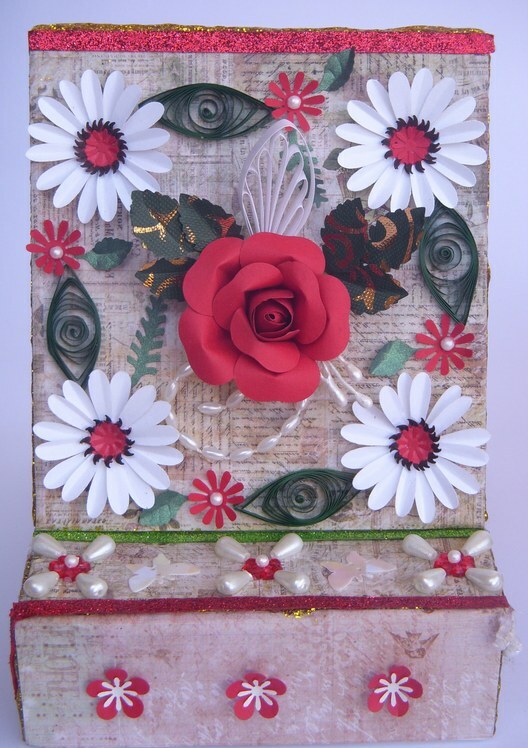 2.Paper Punches- I used the pear punch for this rose. You can hand cut rough pear shapes too! 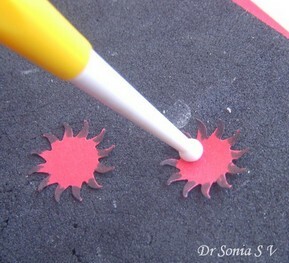 The circle punch is optional-- the circle or any other shape is used to form the base of the paper rose. 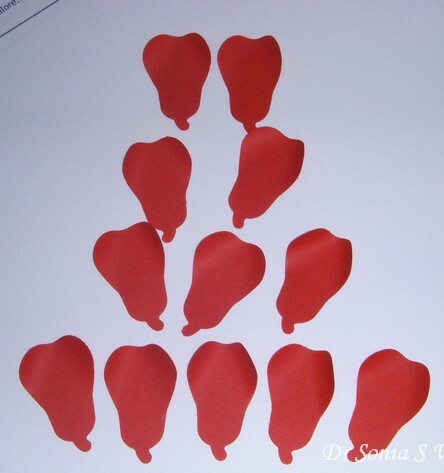 I find it quicker to shape all 12 paper flower petals in one go! 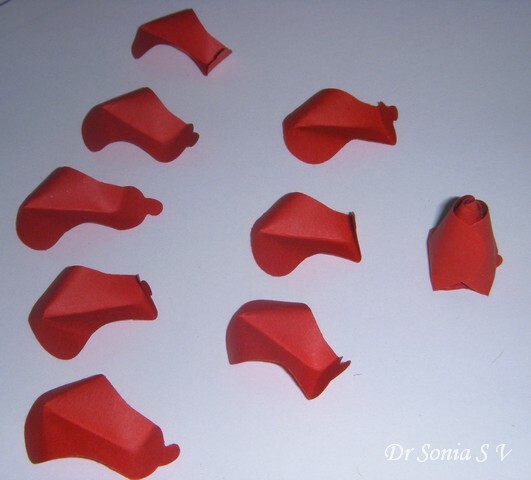 Take 4 of the shaped petals and bend the narrow part of the pear shape at a right angle as shown . Make the inner most petal by increasing the bend of the 2 corners ,applying glue on one corner flap and gluing in place to form a conical bud. Take a 2nd petal and apply glue as shown at the corners and the base. 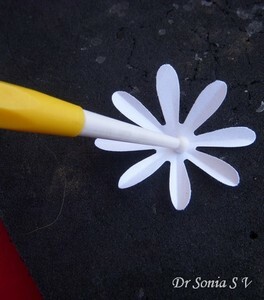 Wrap it around the first petal to make the bud. Take 2 more petals bend at right angles at the narrow part ,apply glue at the base and lower part of the erect part.Slide and wrap both these petals around the bud. You can add more petals in the same fashion to give a more fuller rose bud. 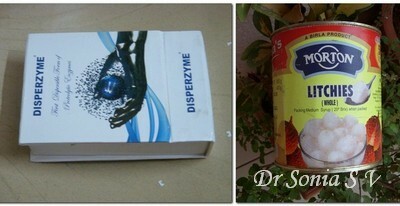 Pinch the upper part of the pear shape with the thumb and index of one finger . 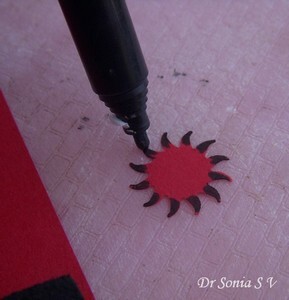 Using the thumb of the other hand to create the central crease makes it quick and easy[Sounds tricky but its not!!]. Bend the narrow base at a right angle. 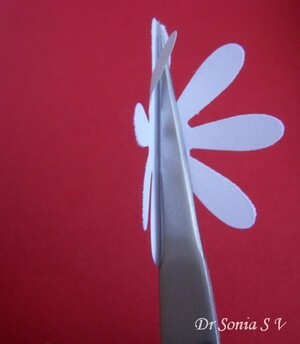 Apply glue at the base and lower edges of the paper flower petal. Place the bud on the base of one petal and wrap the petal around it. In this way surround the bud with 3 petals to make a mini paper flower. 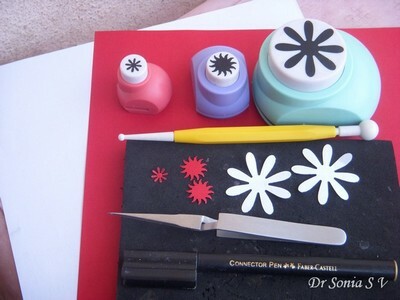 Add 5 petals to surround the central flower. 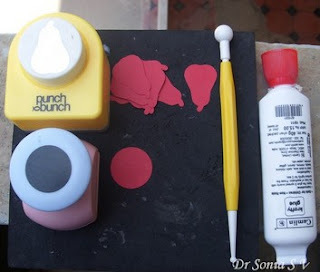 I find this stage the trickiest as I use normal glue which takes its own sweet time to dry! To help the petals stay in place I shaped a circle into a cup and pasted it as a base to hold the petals of the flower together. 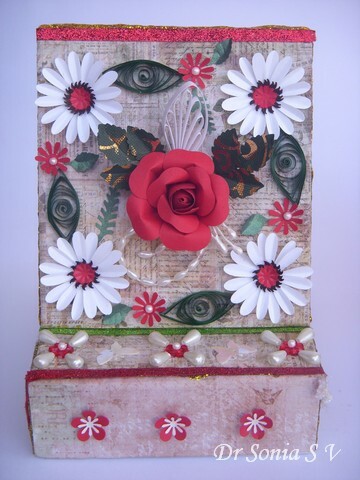 Do tell me how you liked the roses and yet another recycling project . 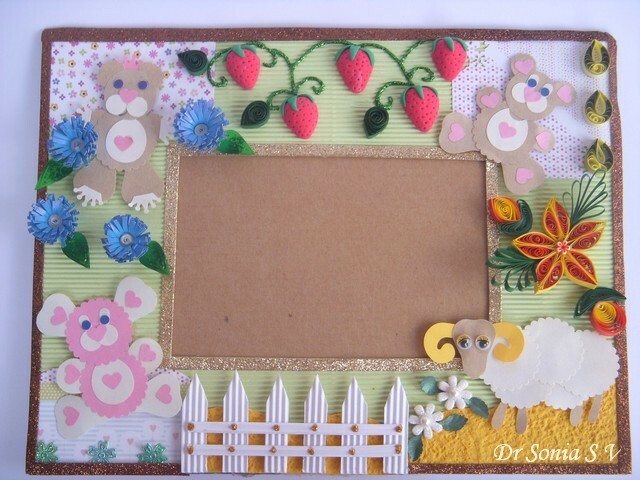 This Photoframe is my Guest DT project for "For Fun Challenges" theme Anything But a Card. Thank You Kathy for inviting me!! 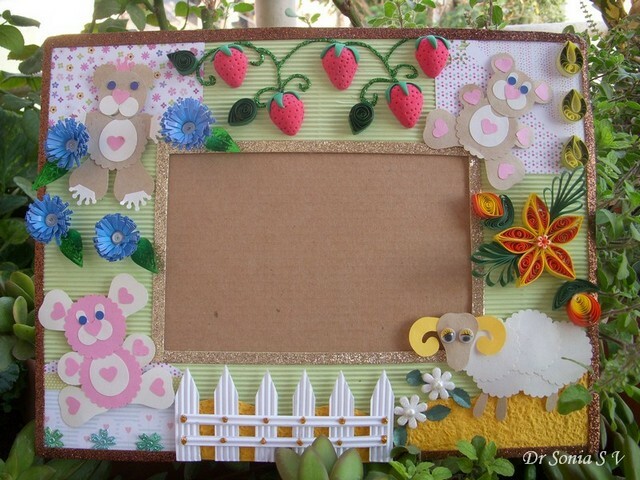 This project combines 2 things I love to incorporate in crafting--Kids crafts and Recycling! My 5 year old designed all these punchart animals! This Punchart Teddy is my daughter's version of Teddy dancing with flowers. These blue quilled fringed flowers were made by recycling a magazine border. I loved my 5 year old's idea of using the crown punch as "claws"! We used the punches shown below to make our punchart sheep. 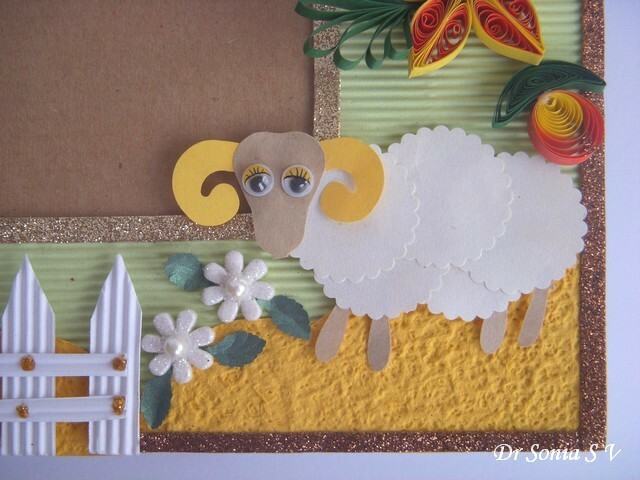 The pear punch is the head.The swirl punch was used to make the horns and the body was made from 5 scallops.We cut out flower petals to make the legs of our punchart sheep. 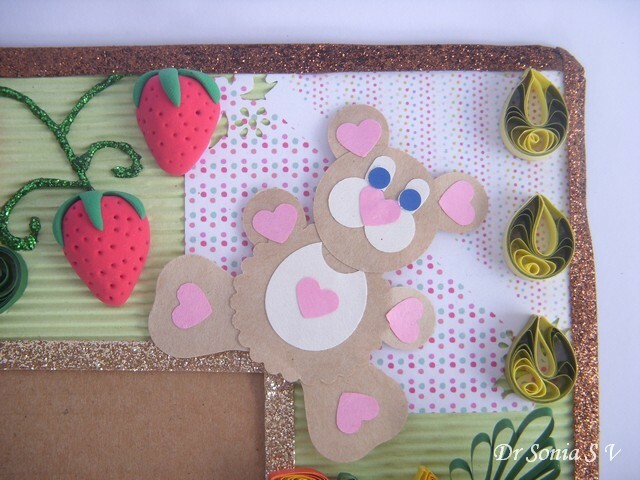 Soft Toy Making - 5 ways Little kids can help! Cant Craft -have burnt my hand !